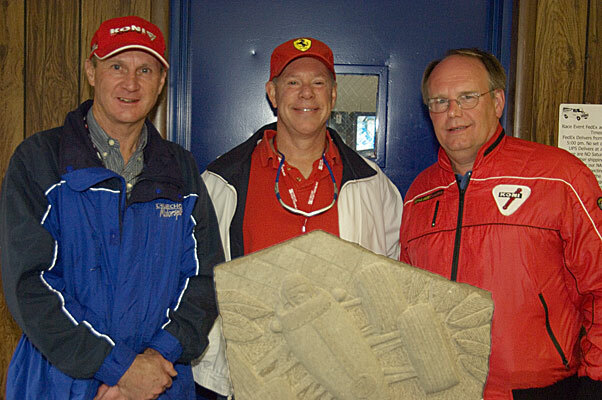 The 2005 Koni Heritage Award is presented by Phil Harris (Truechoice) and Jim Vance (Koni North America) to Bud Moeller, owner and driver of the 1980 Ferrari 312 T5 that was driven by Gilles Villeneuve. In cooperation with Phil Harris and Historic Grand Prix, KONI presents the KONI Heritage Award. This award will be presented to “the competitor that most clearly embodies the spirit and heritage of the era”. This will include livery, team uniforms, helmet graphics, but more importantly is reflected in the team’s attitude and enjoyment of this unique era of F1 history. KONI is pleased to be associated with Historic Grand Prix in their effort to preserve the history of this wonderful era of motorsports. The award is an original work by Karen Heyl. 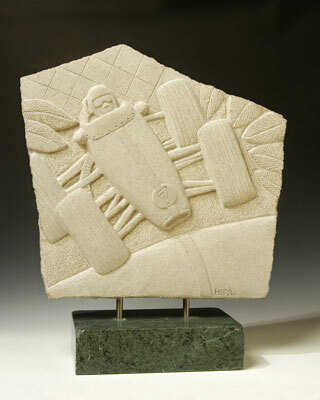 Her award winning limestone mural carvings have received regional and national recognition. Karen works include monolithic shapes carved in the round, one sided flat stones, sculptures in alabasters and marbles from Europe and the American Southwest. Karen works out of her studios in Cincinnati, Ohio and Escondido, California. We at KONI join Phil Harris in our sincere appreciation of Karen’s creativity and talent in capturing the essence of F1. KONI North America is a division of ITT Industries. ITT Industries, Inc. (www.itt.com) supplies advanced technology products and services in key markets including: fluid and water management including water treatment; defense communication, opto-electronics, information technology and services; electronic interconnects and switches; and other specialty products. Headquartered in White Plains, NY, the company generated $6.8 billion in 2004 sales and employs approximately 39,000 people around the world.